I know that some players are stuck in their ways and only play one game their whole lives, and that is absolutely fine. However, some slot lovers like to mix it up daily and experience every game. With this in mind, occasionally I like to talk about one of my favourite games and break down all the finer features. With so many slots to choose from at Joe Fortune online casino, it’s always hard to pick one favourite, but this one always sticks out to me, mainly as I am such a big fan of Australia, and footy of course. Unsurprisingly, Aussie Rules is all about Aussie rules football, and is an absolute must-play for all true-blue Australians. This footy classic gives you all the fun of the field, without getting so much of a speck of mud on you. Not only that, but with a host of features like the umpire wilds, water bottle free-spins and the mighty Goal Kick Bonus Round, you could win a game and be in the money without ever even needing to touch a real footy field. So kick back, kick off your boots, and don’t kick a single ball as you spin your way to the winning score. Aussie Rules is a 5-reel, 15-payline slot with a host of special features. These include wilds that substitute for any symbol except scatters, free-spins that could earn you up to 100X free games, and the Goal Kick Bonus Round where you will have to try and kick the ball between the goal posts. If you get one or all of these, you will be the celebrating like a true footy player in no time. The umpire symbol is wild and substitutes for any other symbols except scatters to form a winning line. Keep an eye out for these umpires as these are important to your game, and can change a potentially non winning line into a bloody ripper. The water bottles are definitely your friends when playing Aussie Rules, and if you land enough of them, they will be quenching your thirst for free games before you know it. Three water bottle symbols will trigger 10 free spins with 3X multipliers, four water bottle symbols will trigger 20 free spins with 3X multipliers, and five water bottle symbols will trigger a massive 100 free spins with 3X multipliers. Not only that, but free spins can be re-triggered during the feature, which could mean that you are in for the longest (and most lucrative) game of footy in history! The Goal Kick Bonus Round is a beauty and is triggered when you land three or more football symbols on the reels. Once you’ve activated this bonus, simply use the ‘kick’ button to kick the ball between the posts and scores goals. These goals translate straight into coins, so make sure your aim is on point – then not only will you will be the top scorer of the match, but you’ll have a nice little kick-back (see what I did there?) to celebrate with as well. So don’t wait around, footy fans. 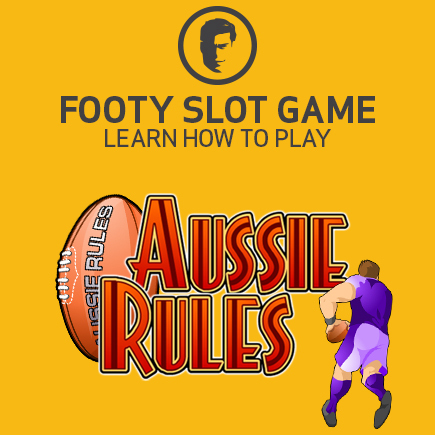 Aussie Rules is ready to play right now, and in this game, everyone can be a winner.